This past fall I took an online craft class from two amazing girls over at Red Velvet Art. It has been one of the best things I’ve ever done. 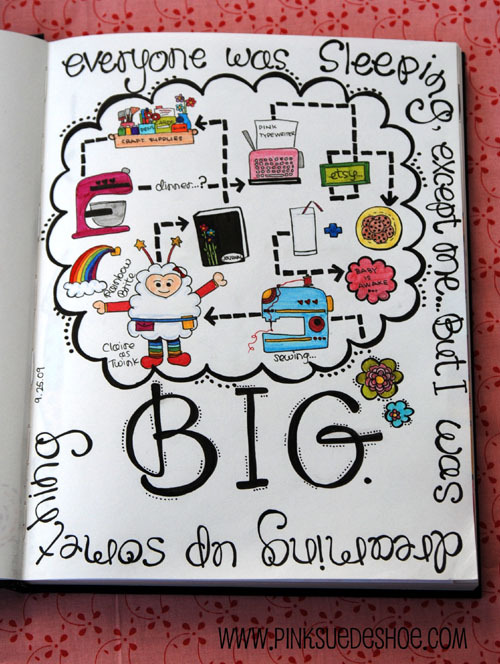 One of our projects has been to keep an art journal. 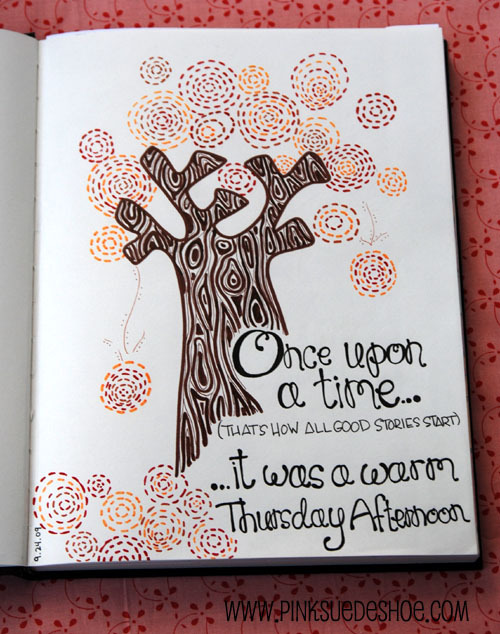 Each week Elsie has given us a few journal prompts to sort of get us started. I will admit right now, my whole life I have been terrible about keeping a journal. I have a million scrapbook pages, but I hate journals… something about the pressure to write every day, and in some sort of chronological order throws me off. And having a whole big page of empty lines to fill up is pretty intimidating when it is giving you that big blank stare. So I don’t do it. I have a few pages I wrote in my teenagerhood, which are all pretty awful, and for a few months while I was living in Russia I wrote as well. So, now we are up to like 12 pages total. 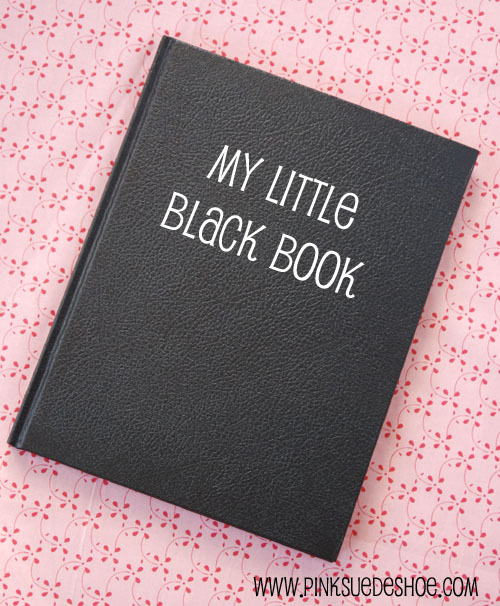 I did keep a journal while I was pregnant with Creamie. 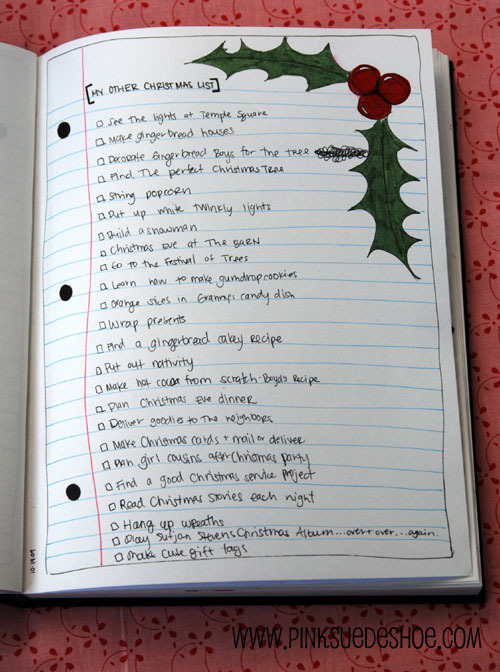 (But it is just scribbled in a notebook, and will have to be made pretty before I am satisfied with it. 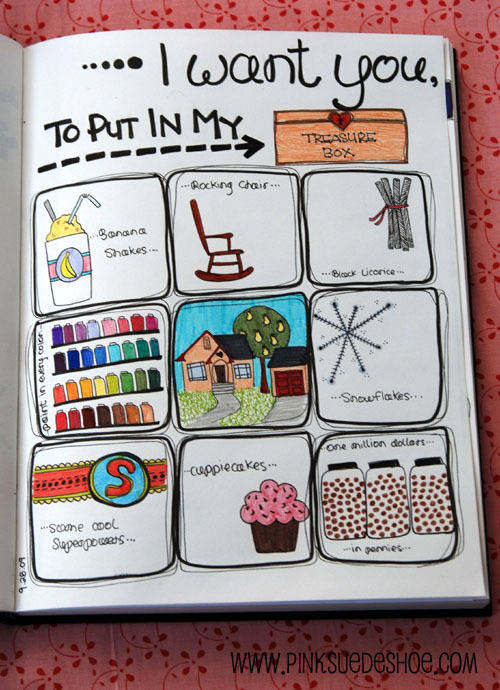 I wrote it with plans to transfer my thoughts onto prettier paper… and add pictures. I’m nerdy like that.) Moving on. 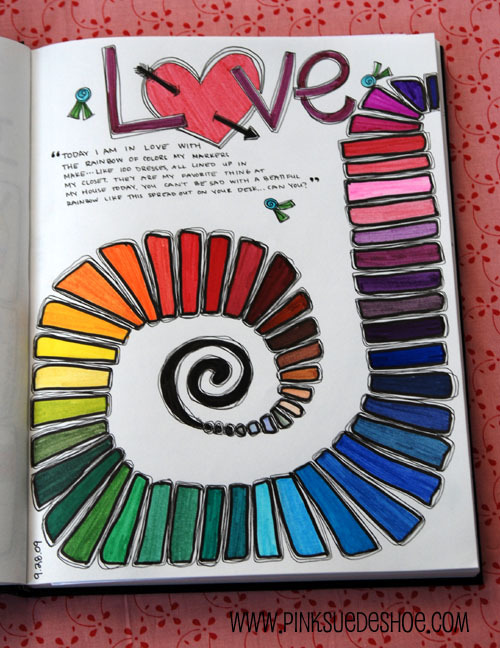 I have loved the art journal project. 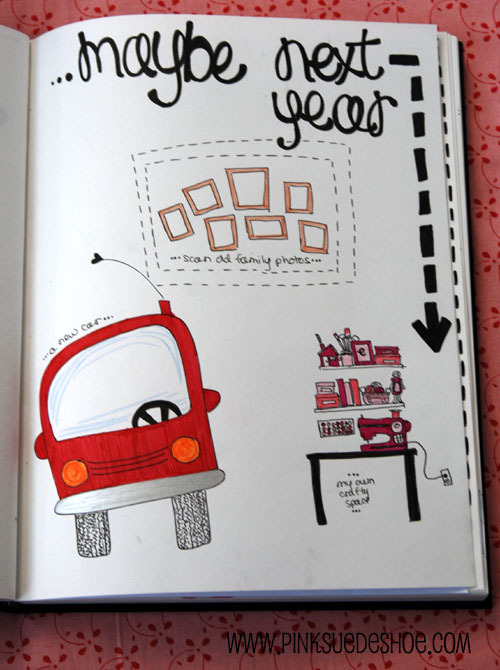 It is has been so much fun for me to draw and doodle to my hearts content and not feel like I needed to fill up with thetelling about my day, or which boys I have a crush on, or what I think my life will be like when I am a grown up and we are in flying cars, or whatever. Here are a few of my favorite pages. Please excuse the little bit of blurry pictures. It’s the shortest day of the year and that means not much good light. As I have been looking back over the pages, it really does hold my hopes and dreams and what I think about most and what I want in my life right now… only it’s cute! 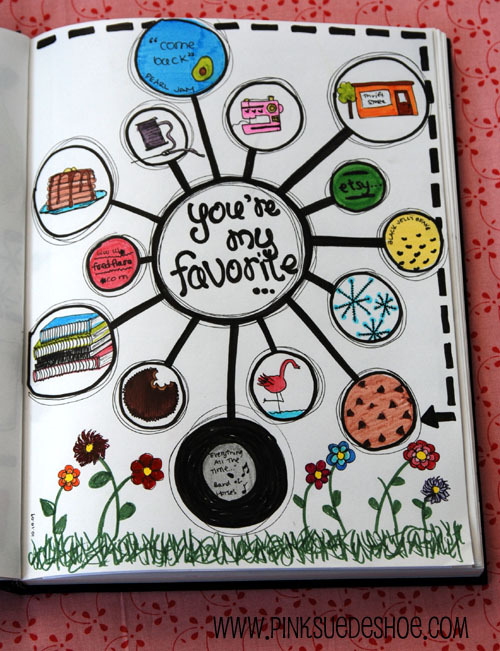 I can also see that I do have an obsession with snowflakes, black licorice, pink typewriters, (well, pink in general) and cookies. I guess that doesn’t really surprise me. Also, conveniently, those are all things that are pretty easy to draw. Funny how it works out that way. I hope you’ve enjoyed a peek into my soul….I really want to take the next class which starts in January. I got to meet so many people all over the world who think just like me… and at least one of them thinks I am funny. Um… that is the cutest thing I’ve probably ever seen. You are one talented lady! Oh my goodness! 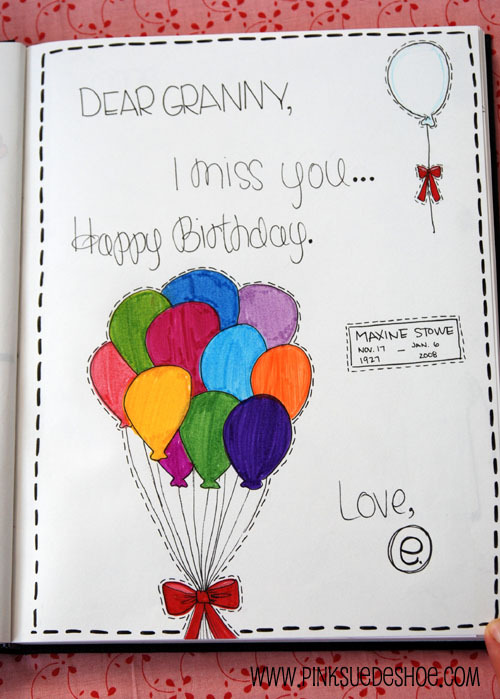 Seriously in love with your pages!!!! These are sooo great!!! Seriously, could you be anymore talented. 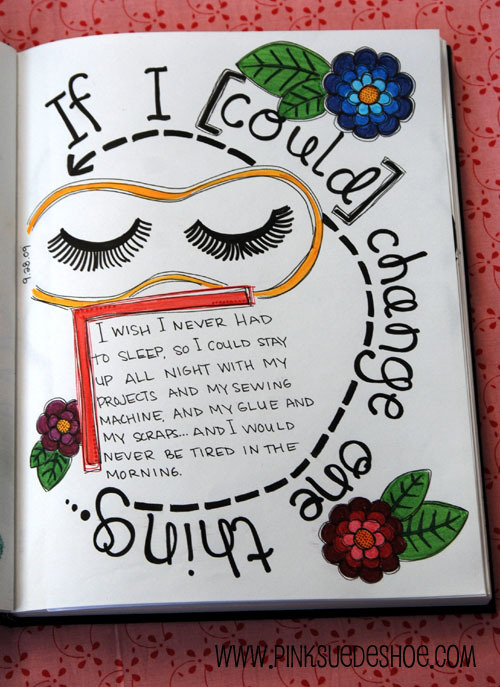 I wish my journal looked like that. At least it will be a lot more fun for your kids to read. Mines a bunch of scribble! What a fun way to journal. And I agree with others, you are so very talented. This is cool! Do I spy your old house on that page? My old house is totally on that page…. I still dream about it. I hope one day to buy that house from our old landlord. Sigh…. until then, it can stay in my treasure box. 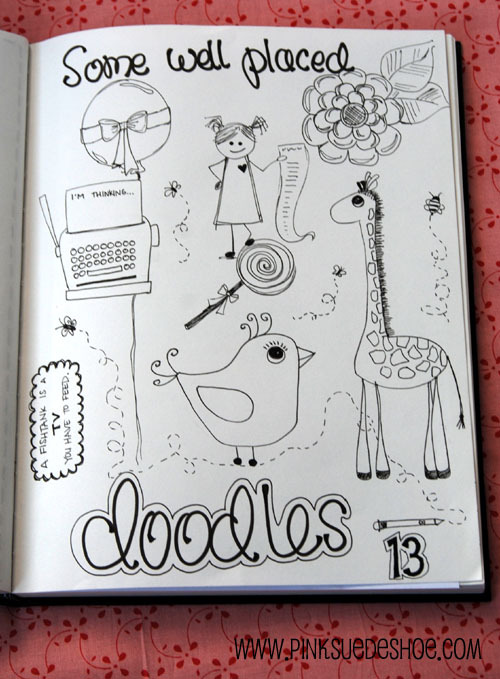 ohhhhhhhhhhhhhh I wish I could “doodle” like that…your black book is amazing!!!!!!!! You should make art for magazines etc! Thanks for all your sweet comments, I have warm fuzzies inside! Pink Suede Shoe, Just loved looking at your ‘black book’!! Posting to my FB closed group Barefoot Journaling Chronicles. I know they’ll love it too. Thank you for posting. 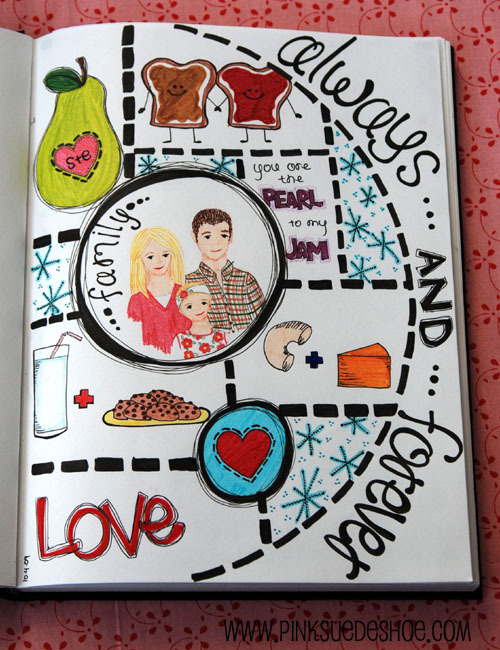 So impressed with your art journaling. Hey, can I have your email? Would love to share something with you.